Can math be fun? Matt Parker thinks so. Matt is always keen to mix his two passions of mathematics and stand-up. In his new book, Things to Make and Do in the Fourth Dimension, he shares with us some of his favourite bits of mathematics, complete with hands-on activities. In fact, the thinking goes beyond the book to his website where you will find accompanying information that supplements the book. Math becomes more enjoyable with a slew of downloads, links and online gadgets. 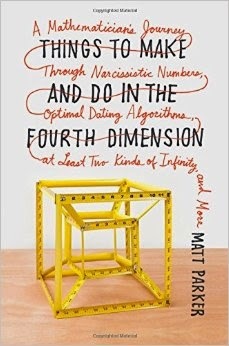 If you read something in the book and are disappointed to not find more about it in Things to Make and Do in the Fourth Dimension, then Matt Parker also recommends that you send him an email and he’ll try and see what he can do. I suppose I have yet to explain what the book is really about. Think of math problems explained in a simpler, more amusing manner. Starting with the foundations of “school” math, Matt Parker revels how it’s possible to climb all the way to the topology and to four-dimensional shapes, and from there to infinity – and slightly beyond. With games and puzzles, this is not a book you’ll be reading leisurely in bed. Get ready to jump right into it with your pencil and notebook. Perhaps it’s one way to re-learn all that you missed in school.